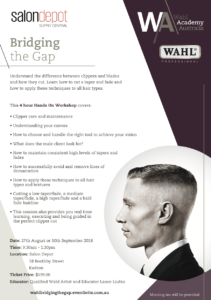 Wahl Academy is back with another in store training session at our showroom in Kedron! The next training day is coming up on the 10th of September. They are delivering a session all about clippers, blades, taper cuts and fade cuts. All the details are included below! Check our What’s On page for upcoming training days.